Who said Golf is a Summer Sport? Summer may be over but your golf season certainly doesn’t have to be. If you’re like me, sometimes golfing in 90 degree weather can be…well, less than enjoyable. Thankfully, we have Fall to look forward to. 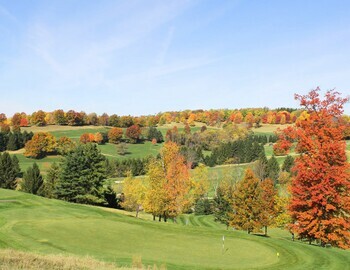 There are plenty of reasons to golf in the Fall and I’m here to share a few of my favorites! As I noted above, I don’t do too well in the blistering hear. Fall golf generally means cooler temps and that’s perfectly fine with me. Don’t get me wrong, I golf in the summer too, but there’s something about the crisp Fall air that leads me to the first tee. One of the best things about golf is that it may be one of the only sports where you can wear virtually whatever you want it. With the temperatures falling, don’t be afraid to break out the layers! Break out your best Bill Murray argyle sweater, the John Dailey inspired pants or Phil Mickleson vest. You know what they say, look good, feel good, play good! It’s no longer the “busy season” which means you can typically find better deals for 18 holes. Volume goes down from the Summer rush which means courses are forced to reduce their rates – aka better prices for you! One of the best ways to get better at golf is to swing more! It’s as simple as that. Use the Fall to continue working on your game. As stated above, it’s cheaper, there are open tee time slots and if you do it enough you’ll end the season at the top of your game! Tell us why you love golf in the Fall and follow us on social media!